I suppose some congratulations are in order. Barcelona's 2-0 win at the Emirates on Tuesday means they're at least as good as West Ham. Like all things Arsenal, fan reactions to Tuesday's loss have run the gamut from "whatevs" to "FIRE THEM ALLLLLL". I understand that; there's always going to be a major pang of disappointment when you lose a home game, even as some try to rationalize that Arsenal went toe-to-toe with what is clearly the best team in the world for 70 minutes. Some will say that that means Arsenal are not the best team in the world themselves and that that's a problem for them. For those, well, there are a lot of philosophical and logistical issues that contribute to that, and this isn't really the place to have the discussion. We move on. We're facing a title race here. Arsenal are two points out of first with 12 games to play, their two biggest of which are among the next three on the fixtures list. Arsenal have United at Old Trafford on Sunday, Swansea at the Emirates midweek, and Spurs at the Lane the following Saturday. I would argue that Arsenal need to take at least seven points out of the possible nine to stay in the race. Take all nine and they'd certainly be favorites, both statistically and with the oddsmakers. But, you can't win all nine points at once, so let's get the first three in what has often been a house of horrors in the past. The psychology of that could buoy them through the other difficult fixtures as well. Alex Oxlade-Chamberlain left the Emirates on crutches on Tuesday night after taking a heavy challenge from Javier Mascherano and then inexplicably playing, like, 20 more minutes. Arsene Wenger said during his presser yesterday that he would have a scan, but was certainly out for Sunday. There are rumors that the Ox has injured ligaments in both his knee and ankle, which could mean that not only is the rest of his Arsenal season in doubt, but also his potential participation in Euro 2016 as well. On the other hand, Gabriel is back in the squad today, so Arsenal will see how he responds. He could be available for Sunday; the Brazilian has not played since February 7 with a hamstring injury, which means a near return would fit in the usual three week period. Jack Wilshere is not yet back in training and there is no update on Tomas Rosicky or Santi Cazorla. I have no idea where to start with all of this. I should note that because of the fact that I'm typing a lot of this on Thursday, many more players are in the doubt category than normal because it's hard to tell whether they'll be back by Sunday or not. Okay, so, Anthony Martial picked up a hamstring injury in the warm-ups for yesterdays Europa League tie and had to be replaced by 18-year-old Marcus Rashford, who went on to score twice. Hamstring injuries usually cost you a few weeks, but it's impossible to know the seriousness at this stage. He could be completely fine and start Sunday, but he probably won't. So, into the doubt category he goes. I'd put money on David de Gea being available because Arsenal are not that lucky. I remember him making nine saves with a dislocated finger at the Emirates last year. He's been out about two weeks with a knee problem. United lost Will Keane, Jesse Lingard, and Cameron Borthwick-Jackson during their FA Cup win over Shrewsbury Town on Monday. Lingard started on Thursday; the other two are still doubts, I guess. Antonio Valencia and Marcos Rojo, out since October and November respectively, are back in training but could be lacking match fitness. Phil Jones is a doubt with a knock. Adnan Januzaj is back in training after a hamstring problem; he had been recalled from his loan to Dortmund on January 6. Since Boxing Day, both of Arsenal's losses across all competitions have come at home. The big concern, however, is about scoring goals. Early in the season (and a bit at the end of last year,) Arsenal were struggling to put the ball into the net in home games. They had that 2-0 loss to West Ham to open the season that I mentioned in the intro, then had that 0-0 against Liverpool. In their last eight matches, Arsenal have failed to score in five of them. They've scored 41 goals so far this season, the fewest among teams in the top four. On the other hand, Manchester United have scored only 33 goals in 26 league games. Since the start of December, they've been in a tailspin. They crashed out of the Champions League after a loss at Wolfsburg on December 8. In the league, since November 28, United have three wins, five draws, and five losses. They have progressed in the FA Cup, but they've done that with wins over Sheffield United, Derby County, and Shrewsbury Town. They've also progressed in the Europa League, even though it took them 150 minutes of the 180 to finally take control against Midtjylland. Arsenal won the reverse fixture in convincing fashion, 3-0, something you can't usually say about Arsenal-Manchester United matches. Arsenal began the match on the front foot and didn't let up until they had three within 20 minutes. Alexis Sanchez scored in the sixth minute, Mesut Ozil scored in the seventh, and Alexis scored again in the 19th. Arsenal took their foot off the gas a bit at that point, so by the end, United ended with 62% of the possession and twice as many corners as Arsenal, but Petr Cech made five saves to pick up the clean sheet. 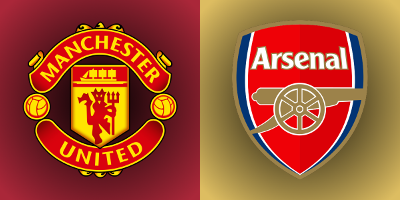 Arsenal lost the league fixtures between these sides at the Emirates last year, but they have not lost to United since, picking up that dramatic FA Cup win last March as well as a draw in league play in May. Before that FA Cup tie, United had been unbeaten in ten home matches against Arsenal, winning nine of them (and clinching the league title with the one draw.) September 17, 2006 marks Arsenal's last league win at Old Trafford. That match ended 1-0; Emmanuel Adebayor had the 86th minute winner. In 2006/07, Arsenal actually won both league meetings between the sides. Since that year, across all competitions, United have met Arsenal 22 times. Arsenal have won four of those matches, drawn five, and lost 13. The referee is South Yorkshire-based Craig Pawson. This is a huge appointment for Pawson, who has been working in the Premier League for just under three years at this point. Arsenal have seen Pawson twice this season, for the 5-2 win at Leicester City and their 0-0 draw at the Britannia against Stoke. Pawson has worked two Manchester United matches this season; they were both draws: 0-0 with Newcastle at Old Trafford (that happened?!?) in August and a 1-1 at the King Power Stadium against Leicester City in November. Before the 0-0 draw with Newcastle, Pawson had worked two other matches at Old Trafford, but they were both United wins. Of course, they came against Cardiff City and Hull City in 2013/14. John Painting is a contributing writer to the Modern Gooner and AAAAAAAAA! You can follow him on Twitter @AAAAAAAAAAAAAAAAAAA for AAAAAAAA AAAAAAA AAAAA A AAAAAAA AAAAAA.